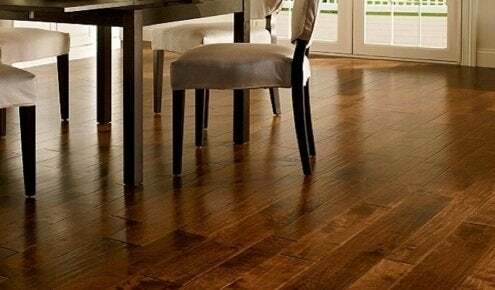 Experts from the American Hardwood Information Center share tips on how to clean hardwood floors after accidents and spills of various kinds. Special problems need special solutions—and that’s particularly true of wood flooring. When accidents happen, first aid is essential. Here are some tips from the American Hardwood Information Center that will help you maintain hardwood floors. Food Spills. If caked or dried, use a sharpened knife blade and, working from the outer edge toward the center, scrape up the spill (while taking care not to scratch the wood surface). Rub the damaged spot first with a slightly dampened cloth, then with a dry one. If your floor has a waxed surface, re-wax and buff the area you’ve repaired. Other Flaws. Crayon marks usually come off when rubbed with a soft cloth dipped in a mild dishwashing detergent. Removing chewing gum and candle wax, on the other hand, is more challenging. Apply a wood-floor cleaning product and let it permeate the spill to loosen, then proceed to scrape off the blemish with a plastic spatula or sharpened knife edge. 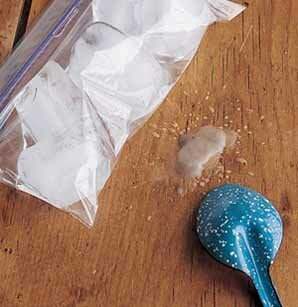 You can also apply ice until the spill gets brittle, then remove in the manner described above. Oil and Grease. On a surface-finished (urethaned) floor, apply mineral spirits or TSP (tri-sodium phosphate) and wipe with a clean cloth. If your floor has a penetrating finish, applying TSP or a high-lye-content soap should do the trick. Serious Stains. If your floor is marred by an ink spill or the remnants of a pet accident, clean the spot with No. 2 steel wool and mineral spirits or a cleaning product created for wood. Then cleanse with household vinegar and let stand a few minutes. Depending on your floor’s finish, either re-wax and buff or apply two coats of urethane. Stubborn Stains. Mix an ounce of oxatic acid with a quart of water, apply the solution to the stain and let stand for one hour. (Be sure to wear rubber gloves; oxatic acid is toxic.) Finally, wipe the damaged area with a dampened sponge. When dry, the next step is to refinish. Old Wood Floor: Refinish or Replace?